They thought the dark times were over. They were dead wrong. Eleven months after he was attacked on board the Atlantic Anthem, Daniel Blake has made a full recovery. Physically at least. The mental scars from what Oliver Gill did to him have been harder to deal with. But Daniel’s a survivor, and determined to move forward with his life. One that includes Elijah Mann. Elijah has been a constant source of support throughout Daniel’s recovery. His love and encouragement have brought Daniel through the darkest days. Living together and deeply in love, they are stronger than ever. Daniel has returned to work and is doing what he does best—entertaining the crowds in a smash hit summer show at Blackpool’s Winter Gardens, while Elijah has triumphed in a celebrity TV cooking show. On a personal and professional level, life is finally getting back to normal. Reader advisory: This book contains some use of racist, misogynistic and homophobic slurs by secondary characters. It also features references to stalking, violence, attempted murder and torture which some readers may find disturbing. Copyright © Thom Collins 2018. All Rights Reserved, Totally Entwined Group Limited, T/A Pride Publishing. The audience rose to their feet and applauded. The entire auditorium went crazy. Standing in the wings, waiting to take his curtain call, Daniel Blake couldn’t hold back his smile. Blackpool Opera House had a capacity of almost three thousand people, and everyone there showed their appreciation. The noise was deafening as the company and supporting players took their bows. Nothing could equal this. It was electric. For two and a half hours, the cast had kept the audience enthralled. They were on the second performance of the day, but the energy level never faltered. Everyone involved in the show, front and backstage, was at the top of their game. The crowd had reacted and laughed in all the right places. With everyone back on stage except the two star players, the applause reached a new peak of excitement. On the opposite wing, waiting for her cue, stood Daniel’s co-star, Max LaFranchi. She flashed a megawatt smile and gave an excited thumbs-up. Max had been entertaining audiences since she was twelve, and standing ovations were nothing new to her, but even she appeared wowed by this response. She gave Daniel the nod, and they entered the stage from their opposite sides. The noise came out of the auditorium in waves at a near-deafening level. They met in the center before taking each other’s hand and walking to the front. The excitement was palpable. “Wow,” Daniel gasped. Seven weeks into a two-month run and the audience reaction hadn’t faltered. Night after night it had maintained the same level. In all his career, he hadn’t experienced such a definite hit. He lost track of time as the curtain came down, only to rise again moments later. The applause seemed endless and when the curtain dropped for the last time the euphoria didn’t die with it. “Can you believe it?” he said to Max. Cast and crew scurried around them, eager to be done now the show was over. Max LaFranchi was show business through and through. A former child star turned theatrical diva. Now fifty-four, her passion for the stage and the audience remained undimmed. The staggering success of Lady Lynda had taken everyone by surprise. Launching an original show was always a gamble. More so in these days of jukebox musicals and movie-to-stage adaptions. The script was a winner, hilarious and poignant by turn, and the songs were immediately catchy, but it was still a major risk. Too much so for the producers to chance launching it in London, even with the pulling power of two big name leads. A summer in Blackpool was a means to trial the show away from the harsh eyes of London critics. To discover what worked and what didn’t and make the necessary changes. But from the preview shows in July, scarcely a word had been altered. The audiences had loved it from the start and the entire run had sold out. With no show scheduled for Sunday, he wasn’t due back on stage until Monday evening. And Daniel had a good reason to go home, the best reason­—Elijah. His lover and soulmate. The only man who mattered. They hadn’t seen each other for two weeks and it felt like a lifetime. Skype and FaceTime didn’t cut it. Daniel had to see him in the flesh. To hold him and kiss him, stroke his hair and breathe in the smell of him. He’d go mad if he had to wait much longer. Daniel hurried to his dressing room. He would have to be quick. He didn’t want to offend Max, but he needed to be on the road as soon as possible. Elijah was already waiting. He’d texted earlier to let Daniel know he’d arrived home safely. Daniel couldn’t wait to get there. Since the show had begun, they’d seen each other at least once a week, but work commitments for Elijah had kept him away last weekend. Daniel had stayed in Blackpool rather than go home to an empty house. He was a realist. They were entertainers and traveling was part of the job, but he hated the time they spent apart. Seeing each other once or twice a week was enough. It gave him something to look forward to. But these last two weeks had been too long—all he’d been able to think about was tonight. Joe, his wardrobe assistant, stood alert in the dressing room when Daniel entered. He’d argued that he didn’t need help to put his clothes on, but Lady Lynda was set in the 1920s and a hell of a lot of money had gone into the costumes. It was Joe’s job to look after the clothes and make sure he didn’t ruin them. “Another great night.” Joe grinned, hanging up his jacket. At twenty, Joe had lived in Blackpool all his life, giving him a strong regional accent. Joe was slim with a crown of dirty blond hair. He had a wide mouth with cupid-bow lips and the most intensely colored olive-green eyes. Kind of cute but not Daniel’s type. Too young for a start. Besides, no man compared with Elijah. “I knew you were a party boy,” Daniel joked, unbuttoning his shirt. Daniel stripped to his underpants and gave the clothes back to Joe. Backstage in a theater was no place for modesty. Joe had seen it all before. Daniel sat at the mirror and carefully extracted the microphone wires concealed in his hair, then set about cleaning off the stage makeup. Makeup was all part of the job, but what a relief to wipe it off. Clean at last, he gazed at his bare reflection. Two shows in one day could take a toll and he often came off stage exhausted. But not tonight. With the exuberance of the curtain call and the anticipation of seeing Elijah, Daniel’s sky-blue eyes were luminous. Daniel’s looks had played a massive part in the success of Lady Lynda. His square jaw, with its cowboy cleft and his sharp cheek bones, were traditionally handsome in appearance. His matinee idol image suited the old-fashioned style of the show. Daniel brushed his dark brown hair off his forehead and set about dressing. He drew on a pair of jeans and a black T-shirt, clean socks and shoved his feet into a trusty pair of Converse shoes. He was good to go. Five minutes with Max, then he was out of here. As he headed to her dressing room, one of the backstage assistants rushed toward him. He would greet the fans before seeing Max. Some of them had to face a long journey home and he didn’t want to keep them waiting. Another round of applause erupted as he stepped out of the door. Daniel smiled widely at the people waiting. There looked to be around fifty. Oh boy, this’ll take some time. He wouldn’t complain, but of all the times to get delayed at the theater, why did it have to be tonight? He loved his fans, people paid a lot of money to see the show, but all he wanted, right now was Elijah. The people waiting had already organized themselves into a queue. He signed autographs and posed for photos. A lot of actors were sniffy about meeting people at the stage door and often tried to find an alternative route out of the theater. Daniel had no time for such pretensions. He could only do this job because people bought tickets to see him. “When is the show going to open in London?” asked an ardent woman in her early fifties. The line moved slowly. He made time for everyone but signing all those programs and posing for selfies was no quick job. They were the usual blend of people—a mix of middle-aged housewives and gays, tipsy girls on a night out and shy kids. Not that ancient. Less than a year had passed since that fateful voyage on The Atlantic Anthem. Some days, it felt much less than that. He finally reached the end of the line, though the crowd were in no hurry to leave. “Will Max be coming out soon?” a well-dressed older guy asked. “I’ll get her for you,” he said, slipping back inside. Duty done. If he came out behind Max, he could get away while she distracted the fans. Loud music came from her dressing room. He recognized it as a song from the show, though it had been given an over-the-top dance remix. Daniel knocked and entered. Inside, it was crowded. She had the biggest room in the theater, but with a dozen people jammed in and flowers on every surface, there was no space to spare. Max had taken off her costume and removed her wig. She was brushing her shoulder-length, coppery-gold hair when she caught his reflection in the mirror. Max’s big number in the show was a song called Roses and Raindrops. The original version was bombastic and camp, a big-diva moment at the end of act one. This remixed version sent the song into the stratosphere. “What the hell is this?” He laughed. He threw open his hands. “Totally jealous,” he exaggerated. “We’ll go out together,” she said, applying blood-red lipstick. She came back from behind the screen wearing slim-fitting black pants and a sheer black top. Even in her towering heels, Max LaFranchi was tiny. She had the petite figure of a young girl. She crossed back to the dressing table and began layering on gold chains and bangles. “Maybe there’s a hot guy out there waiting to meet you,” Daniel said. “Love turns up when you least expect it.” That was certainly true. With everything that had happened on The Atlantic Anthem, the last thing Daniel had expected was to fall in love. As predicted, when she tottered out of the stage door, the whole crowd rushed to meet her. Daniel moved to the edge and slipped away unnoticed. Eleven-fifty. Not too bad. The traffic home to Leeds would be light. With a little luck, he’d make it in an hour. There were butterflies in his stomach as he hastened to his car. He was going home to Elijah. He’d be there soon. 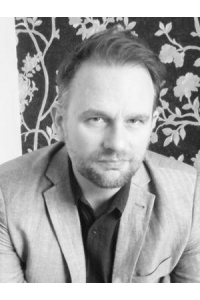 Thom Collins is the author of Closer by Morning, with Pride Publishing. His love of page turning thrillers began at an early age when his mother caught him reading the latest Jackie Collins book and promptly confiscated it, sparking a life-long love of raunchy novels. Thom has lived in the North East of England his whole life. He grew up in Northumberland and now lives in County Durham with his husband and two cats. He loves all kinds of genre fiction, especially bonkbusters, thrillers, romance and horror. He is also a cookery book addict with far too many titles cluttering his shelves. When not writing he can be found in the kitchen trying out new recipes. He’s a keen traveler but with a fear of flying that gets worse with age, but since taking his first cruise in 2013 he realized that sailing is the way to go. You can take a look at Thom's Blog and follow him on Twitter. Share what you thought about Anthem of the Dark and earn reward points.